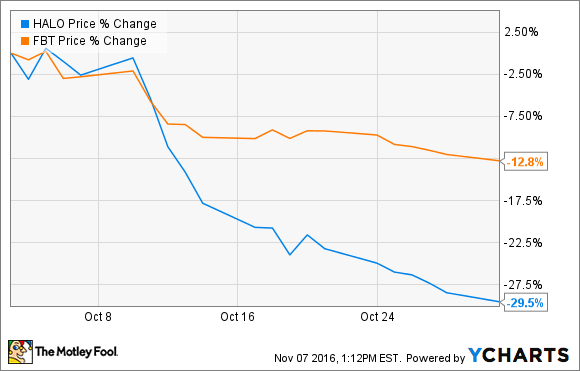 Why Did Halozyme Therapeutics, Inc. Plunge 29.5% in October? Shares of the small-cap biotech fell hard despite producing little news. Halozyme Therapeutics, Inc. (NASDAQ:HALO), a small-cap biotech focused on products that enhance drug delivery, fell 29.5% in October, according to data from S&P Global Market Intelligence. That was much worse that the biotech sector, in general, as measured by the First Trust NYSE Acra Biotech ETF (NYSEMKT:FBT). Halozyme had a quiet month on the news front, so you can't blame the decline on negative press releases. In fact, the only news to come out of the company during the month was an announcement that its investigational drug PEGPH20 will be used in a new pancreatic cancer clinical trial initiative called Precision Promise. This initiative is a collaboration between clinicians, researchers, and drug developers, and has set a goal of offering patients treatment options based on the molecular profile of their tumors. The program kicks off in the Spring of 2017. Given the complete lack of other news, I'm left scratching my head as to why shares performed so poorly during the month. Despite the plunge, Halozyme continues to offer investors reasons to be optimistic. For one, management recently raised its revenue and cash balance guidance for 2016. In addition, investors have a catalyst to look forward to in the fourth quarter. Management will be announcing mature response rate and progression-free survival data from stage two of a phase two study that used PEGPH20 in combination with gemcitabine and Celgene's Abraxane to treat metastatic pancreatic cancer. Beyond the data release, Halozyme continues to make progress on its other product candidates that are being developed in collaboration with big pharma companies like Roche, Johnson & Johnson, AbbVie, Pfizer, and more. In total, the company could earn up to $900 million in milestone payments plus single-digit royalties on any future sales if these drugs pan out. All in all, Halozyme Therapeutics has multiple shots on goal coming up in the years ahead. With the stock now selling at a steep discount, it might not be a bad time for the company's bulls to add a few more shares to their portfolios.